As part of the winter food co-op we belong to we got a bunch of apples in this week’s share. The apples from this particular farm are not great. They are always mealy and not fit to eat just as apples. I really don’t understand why anyone would ever get their apples from this particular farm normally, especially when Reed’s which is also local has such amazing fruit. At any rate this means that I am only using these apples in baked form. My husband requested I make him a Dutch apple pancake, and the nice wife that I am I complied. Our weekend plans didn’t really lend themselves to me making it over the weekend as requested, but I didn’t have to work until 1:30 today so I promised I would make it for lunch before work. The above picture is the result of my labor. Note that despite the way it may look in the picture that is powdered sugar on top of the pancake and not in fact baking soda. This is the recipe I used, although I cut it down to 2/3 of the recipe to make a portion we could actually finish since it’s not something that keeps well. I also added more cinnamon than the recipe calls for as 1/4 teaspoon is not that much. There are a million Dutch apple pancake recipes on the internet. I found this one a couple of years ago and like it, though I might try another version at some point to see the difference. Some people in the comments complain that it is eggy, which is true but which I liked. It definitely has less of a pancake feel to it and more of a souffle texture. Pre-heat oven to 375 F. In a medium bowl, mix together the milk, eggs, flour and 2 tbs. sugar. 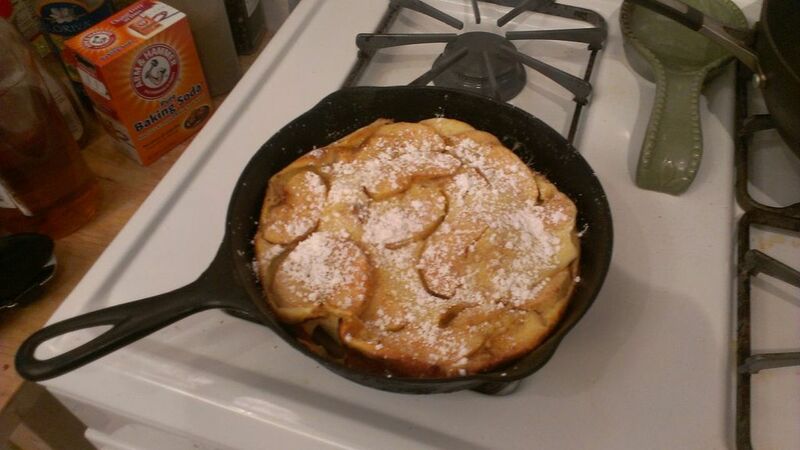 In a heavy ovenproof skillet, melt butter Add apples, cinnamon and the remaining 1 tbs. sugar. Reduce heat to medium and cook, stirring occasionally for 2-3 minutes, or until the apples are softened slightly. Remove pan from heat. Pour batter over the apples in pan. Place the pan in the oven and bake for 30-35 minutes, until the pancake is lightly browned and puffy.